Sprayon® Products, the long-standing leader in delivering reliable, innovative solutions for the most demanding industrial and MRO applications, is proud to introduce the LU™205 Food Grade Chain Lubricant as part of our expanded line of NSF® H1-Rated Food Grade Lubricants. Sprayon® LU™205 Food Grade Chain Lubricant is a blend of the finest quality renewable resource oils available, treated with the most effective anti-oxidants, extreme pressure, anti-wear, and corrosion protecting additives. PTFE is added to further enhance load capacity and reduce friction. LU™205 Food Grade Chain Lubricant offers excellent extreme pressure lubricity, water resistance and high temperature performance on chains and much more. Foaming action allows for pin-point application and deep penetration. 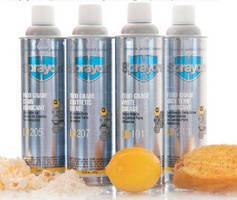 To learn more about Sprayon LU™205 Food Grade Chain Lubricant (and request a FREE SAMPLE), the entire Sprayon NSF® H1-Rated Food Grade Lubricants Program and our revolutionary Sprayon® System which helps facilities extend & sustain 5S Visual Management to the use of their chemicals and lubricants, please visit FoodGrade.Sprayon.com or Sprayon.com. Sprayon’s NEW H1 Food Grade Program features twelve (12) lubricants which were specifically developed to answer the needs of this very broad and demanding environment. These lubricants were designed to specifically address the performance and application needs of today’s food processor. With heavier load pressures, superior resistance to water washout, lower flammability ratings and wider temperature ranges, our offering was specifically designed to preserve and protect your valuable equipment to prevent costly breakdowns and ensure maximum performance. And the NSF Certification and H1 Rating of our Food Grade offering gives you the confidence of knowing our products and processes are in compliance with internationally accepted food safety standards. With Sprayon’s NEW H1 Food Grade Lubricants, you can truly keep your operation safely running at peak performance.